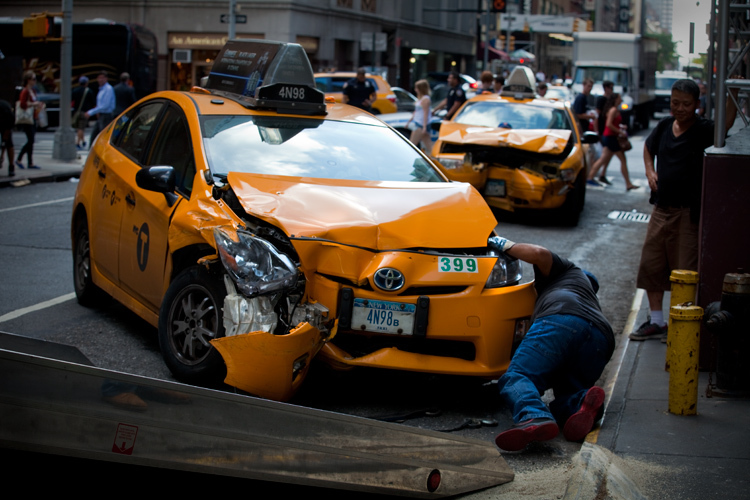 "Eye Witness News.... NEW YORK (WABC) -- Two cabs collided in Midtown, sending one of them onto the sidewalk and into a pedestrian on Monday afternoon. The accident happened just before 4:00 p.m. on Monday at 52nd Street and 7th Avenue. According to investigators, a cab struck another cab traveling south on 7th Avenue. The second taxi careened toward the sidewalk. Police say that one of the cabs ran a red light. The cab struck a pole and a pedestrian standing near. He was taken to the hospital along with the driver of one of the cabs. The nature of their injuries was not known. The pedestrian was standing with his wife and two children at the time of the accident, officials said. They were not injured. The cause of the accident is under investigation." Well I guess its gonna happen from time to time ...... very sad that pedestrians were struck ....... And that a driver was injured ........ Some onlookers were pretty scathing about how some yellow cabs are driven saying they were not suprised to see this ........ I am generally very sympathetic to drivers .... as you know .... and I think most yellow cabs are very well driven. But I did think one of the drivers involved in this was complaining too much about the slowness of the arrival of the tow truck ..... so that he could get back and get another cab....... fair enough as he pointed out he was losing money ....... but I don't know..... it just seemed inappropriate to go on and on about the money lost by the delay when people .... including a fellow driver.... have just been injured in an accident you have been involved in ...... an accident that was probably caused by too much hurrying in the first place ........ I don't know .... it all seemed a little inappropriate so I felt less warmly dispossed toward this particular cabbie than I do normally.